When constructing their new home, the Kolovos family knew they liked the look of real slate for their roof. After doing online research, they found a great alternative: composite slate roofing tiles from DaVinci Roofscapes. The two-story French Chateau style house constructed for the Kolovos family is located in Voorhees, New Jersey. With almost 7,000 square feet under the roof, the home serves as a refuge for the busy family. Installed by Fletcher Roofing, the Single-Width Slate roof allowed the roofing team to streamline operations. The uniform size of the composite slate tiles allowed for speedy installation and reduced waste on the job site. 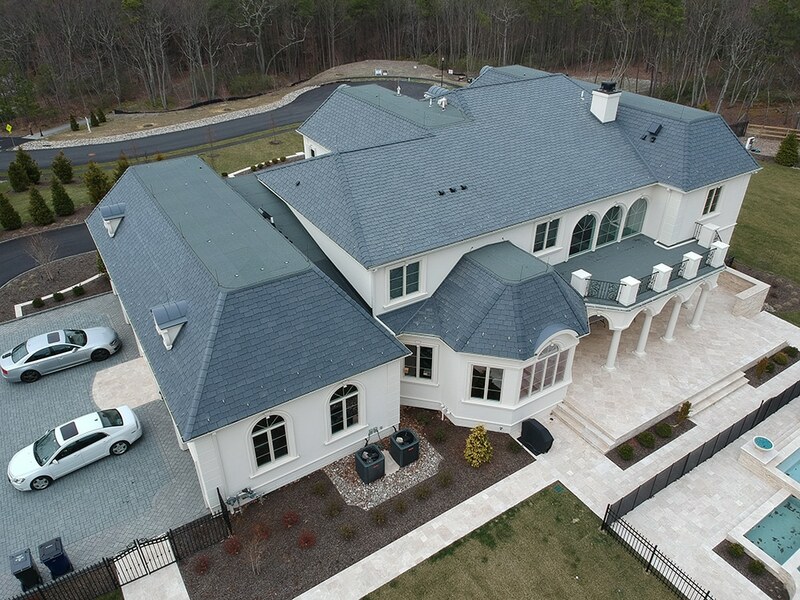 Like other DaVinci roofing products, synthetic slate tiles for the Kolovos home are constructed of a composite material made of pure virgin resins, UV and thermal stabilizers as well as a highly-specialized fire retardant. The result is a state-of-the-art 12” wide tile that proves the greatest degree of color control and consistency in the manufacturing process. The homeowner gets an end product that endures beautifully in any weather. Because the Kolovos selected composite slate tiles, they can rest easy. While real slate tiles are not immune to the ravages of time (or hail), composite slate tiles laugh off bad weather and aging processes. There’s no worry that tiny fissures that occur in natural slate (which come as a result of freeze and thaw cycles) will occur in composite slate tiles. Impressive half-inch thick DaVinci slate products defy the elements for decades of enduring and worry-free beauty.